According to a new study from the University of Portsmouth, using living organisms such as fungi or bacteria as a substitute to chemical fertilizers can enhance the soil biodiversity of green roofs. Green roofs are covered with vegetation and plants and are used more and more in cities to convert buildings into a more energy efficient and environmentally friendly place. However, extended UV exposure, high winds, and random water availability mean that several green roofs are short of nutrients, which can hinder plant growth and the biodiversity of soil organisms. These are the factors essential for the quality of nutrients in the soil. 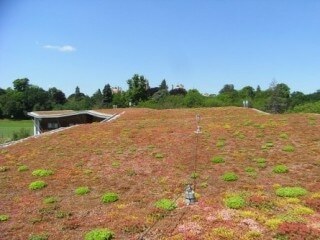 This might have implications for the economic and environmental advantages of green roofs. The research, published in the Ecological Engineering journal, discovered that the incorporation of certain types of microbial inoculants (plant growth-facilitating bacteria and fungi used as a substitute to chemical fertilizers), in particular a fungi called Trichoderma, produced higher populations of miniature insects called springtails (with a size range of 0.25 to 6 mm). Although these changes enhanced the abundance of springtails, they did not result in a positive effect on plant growth. Few studies have investigated whether green roofs are a good urban habitat, particularly for soil organisms. We think that mature extensive green roofs have an established microbial community that may limit the success of commercial inoculants. The premise of our research was that as the soil food chain is lacking, we could try to boost it artificially. We wanted to identify the microbial inoculants that could improve biodiversity on green roofs that already exist and to better understand how healthy rooftop ecosystems sustain themselves. During a field experiment carried out on an old green roof in Egham, outer London, the researchers added living soil organisms including the fungi Trichoderma, soil bacteria, and mycorrhizal fungi, which form the base of a food chain. When observed over a year, the team discovered that certain microbial inoculants were more effective at enhancing the soil food chain than others, with Trichoderma specifically having an encouraging effect on the populations of species higher up the food chain, such as springtails. While we didn’t see the same effect on plant growth, this enhanced biodiversity gives us a clue as to some more specific additions we could try in the future. This information may help us to identify which types of soil microbes to use on our green roofs, so we can maximize soil biodiversity and improve plant survival. The research was funded by the Natural Environmental Research Council, Symbio Ltd and Laverstoke Park. Professor Alan Gange from Royal Holloway, University of London is a co-author of the research paper.